Since I’m always traveling, staying healthy can get really tricky. It’s so easy to order Postmates, especially when you are living out of a hotel, but you can only eat a by CHLOE guac burger so many times before you start to get sick of it 😉 (still trying to count how many of those is too much TBH). Traveling so much takes a toll on your body and it is so important for me to *try* to keep up with my routine that I stick to when I’m off the road. Not having access to a kitchen when I travel makes eating unhealthy so much easier. When I’m home, I love to start my day with two hard boiled eggs, hot water with lemon, and a bulletproof coffee. However, I realized I can’t use that excuse anymore and there are so many other little things I can do when I’m traveling to stay healthy. 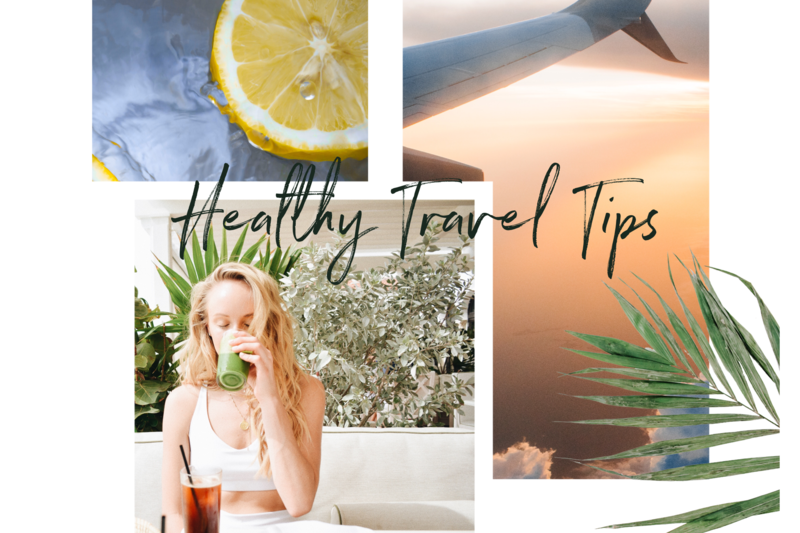 Here are some of my healthy tips for traveling. Disclaimer: we’re all human and sometimes I fall off my routine, but keeping some sense of a schedule and “rules” will definitely balance out that late night Postmates call that’s bound to sneak in here and there. Bag of Teas: Whether it’s on the plane or just in my hotel robe, I love keeping my usual teas on-hand. Move by body once a day: Getting in exercise doesn’t happen often when I travel, so whether it’s walking instead of taking an Uber, or getting up an hour earlier just to squeeze in a quick hotel workout, it really makes a difference in my day. Keep your same routine: Just because I’m traveling doesn’t mean I can’t still have my lemon water or hardboiled eggs. I like to go to a grocery store wherever I am and load my hotel fridge with all the breakfast foods I eat at home. This will stop me from ordering all that room service (at least for breakfast). If I see pancakes on the menu, though, you know I’m ordering them. Stay Hydrated: My skin hates me for traveling so much, but drinking water, even more than when you are home, will keep your skin and body feeling good. If you didn’t already know, water is key. Snacks: Who doesn’t love to snack? I load my carry-on with healthy snacks, especially for those long plane rides. So, instead of reaching for the chips, I keep some mixed nuts or a protein bar on hand. Thankfulness to my father who told me concerning this web site, this website is truly awesome. Thankfulness to my father who stated to me concerning this blog, this webpage is really amazing. Hi there, its nice piece of writing on the topic of media print, we all be aware of media is a great source of information.